Find similar condos for sale to the Cypress Creek Townhomes, from our MLS condo search and get the value of your Cedar Park home or condo in today's market. Stop your search! If you are looking for an amazing condo complex in Cedar Park, you have just found it. Cypress Creek townhomes for sale couldn't be more conveniently located. Sitting on the west side US-183 and east of Lakeline Blvd located on the South city limits of Cedar Park off Cypress Creek Blvd many of the units in the complex are centrally located to major roadways and Austin Metro Tram. There are a variety of units in the Cypress Creek Townhome Condominiums. Cypress Creek Townhomes are designed by Milestone Community Builders, Austin's fastest growing builder with a commitment to delivering a remarkable living environment at the most reasonable price possible. 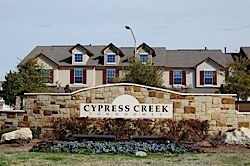 Cypress Creek is the perfect location to enjoy all the best of life in Cedar Park and Austin. You are just minutes from shopping at Lakeline Mall, the acclaimed Leander ISD, the fantastic new Cedar Park music and professional sports venue, and Austin Community College as Cypress Creek campus. Plus, with US 183 and Highway 45 nearby, downtown Austin is only fifteen minutes away and twenty or thirty minutes to downtown you have easy access to all of the major employers from downtown to Dell, Samsung, and more. The community is surrounded by green spaces and is adjacent to a 111-acre greenbelt, offering plenty of opportunity for any number of outdoor activities, including hiking, biking, and kayaking or canoeing. Cypress Creek is your home to relax, rejuvenate, and enjoy time with friends and family. Would you like to know how much your Cypress Creek Townhome is Worth? There are a number of sites on the internet that will give you 'estimates' for what your home will sell for. These sites use public records and usually some kind of algorithm to try to produce a value for your home. These sites also publicly state their 'error rates'. That means they aren't correct, they are simply an estimate based on incomplete data. We would love to do a free comparative market analysis of your home or condo on Cypress Creek Townhomes and let you know what could expect to get in today's market if you are considering selling. Our valuation is based on up to the day data for homes/condos that have recently sold in the area. Our valuation is not based on a formula that relies on public records which can take months to update. Please visit my website in order to get your free property evaluation for your Cedar Park home or condo. Search Cypress Creek Townhomes for sale by clicking here. Get Detailed Reports about Cedar Park Real Estate & Cypress Creek Townhomes.